In March of 2015 I had been traveling non stop for almost 3 months shooting snowboarding and was getting a little burnt out. No matter how beautiful the scenery I was in, it was all starting to blend after so many years working in the snow sports industry. I was starting to get the itch to get out and shoot other things but my work schedule at the time had me going non stop. At the time I was living in Venice CA and finally home for a weekend. When I woke up to go walk for a coffee I realized that the LA Marathon was going on, and finishing just up the road from my house. So I took my coffee, went home and grabbed a small camera bag and my bike and cruised up towards the finish line. I had no plan, just the itch to get out and shoot something different. I remember locking my bike up and thinking what am I doing here?, is this wasting time I could be home with my wife after I’d been traveling for weeks on end? It honestly stressed me out at first, till I started shooting. With no plan or goal I was able to just keep my eyes wide open and feel out the whole scene. I only hung out at the last 1/4 mile of the marathon and quickly was taken by the energy of the scene. 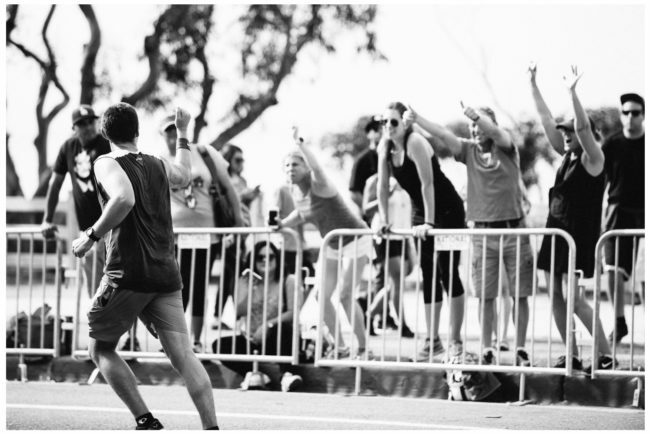 People were cheering for everyone coming through, and you could see it lift their spirits as they finally had the end in sight. 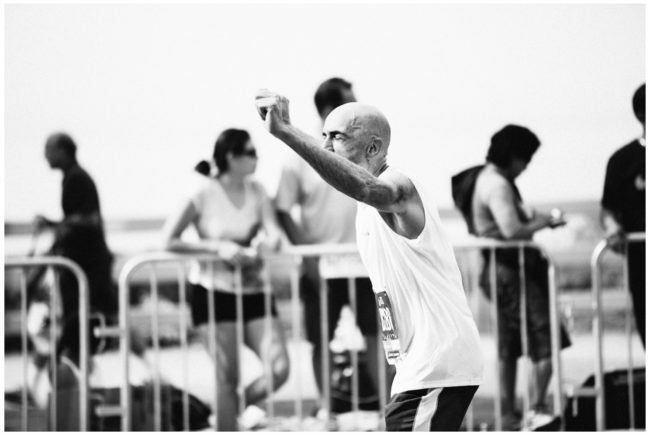 What amazed me the most was the age range of people finishing, it truly made me feel I needed to get in better shape as people twice my age were finishing a run 8 times further than I thought I could make it. 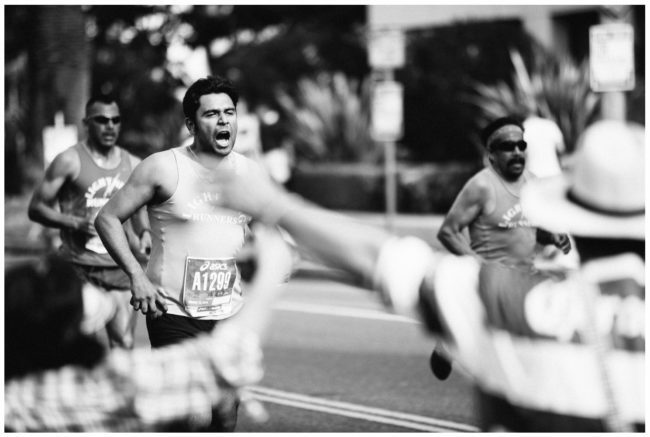 As I kept shooting my focus started to narrow and I was drawn to the emotion on people as they were about to finish. There was such a mix of pain, exhaustion, and elation all at once, with a huge crowd cheering so loud to make sure they made it to the end. When I shoot action sports it’s common to frame in the whole scene, and this allowed me to depart from that and focus in on the elements I was missing in my normal work, close up emotion. 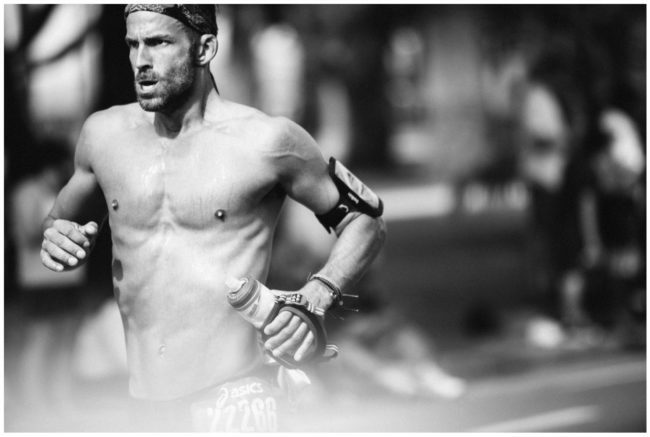 I’ve always loved the feeling of gritty b/w photos and wanted to keep it that way so the loud colors of running gear and bibs wouldn’t distract from feeling in the shot. This was one of the first times I shot running and fitness work and it sparked something in me that I keeps me wanting to shoot more and more of it these days. In the end after being burnt out on work, I came home from the race and spent my first Saturday at home editing photos, feeling inspired again. So here it is, the last 1/4.